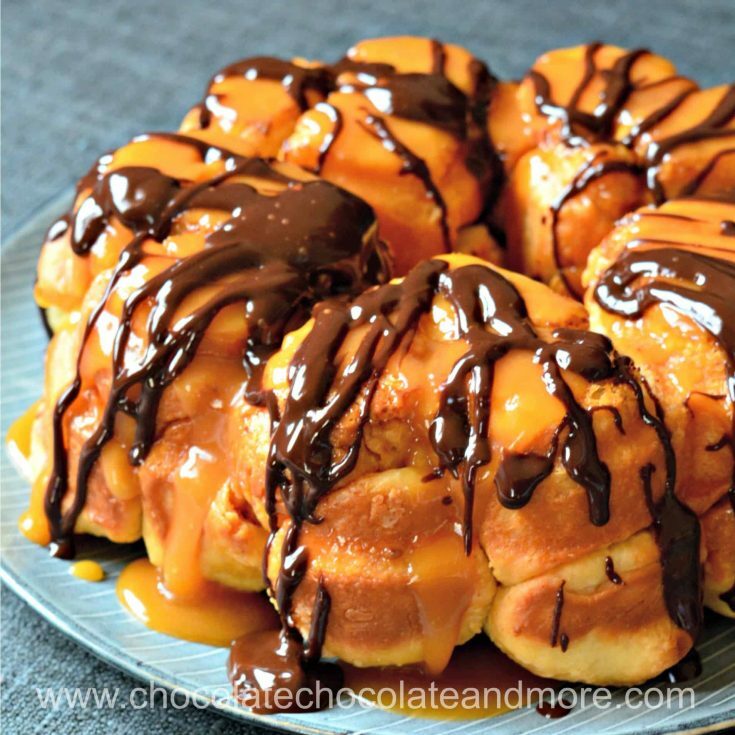 Chocolate Caramel Monkey Bread - Chocolate Chocolate and More! 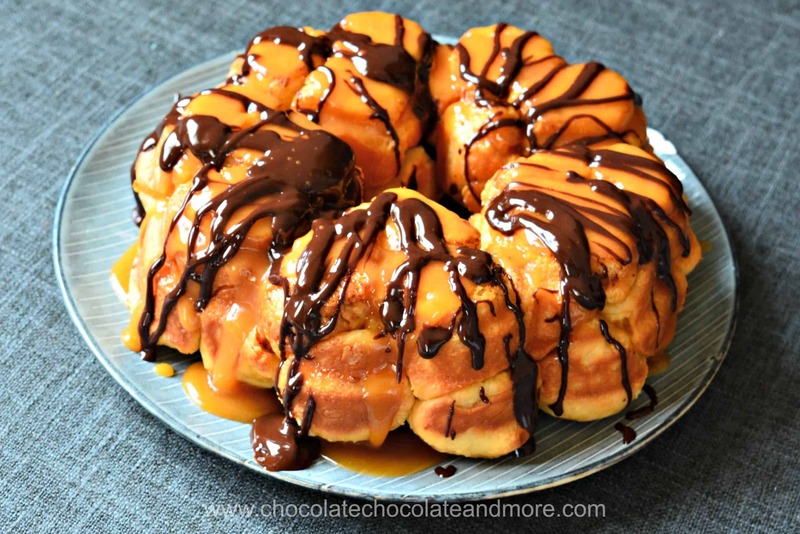 Chocolate Caramel Monkey Bread – Soft buttery bread filled with chocolate and caramel topped with chocolate and caramel sauce. Make sure you have some friends over so you don’t eat this all by yourself! I’m glad there’s a hair salon below my apartment. I often give the employees the things I bake for the blog because I can’t eat them all myself. Most of them don’t speak English but they get really excited for homemade treats. I’m sure they don’t make much money and baked goods are expensive here. Best of all, it keeps me from eating them all. I was especially glad after I made this bread. 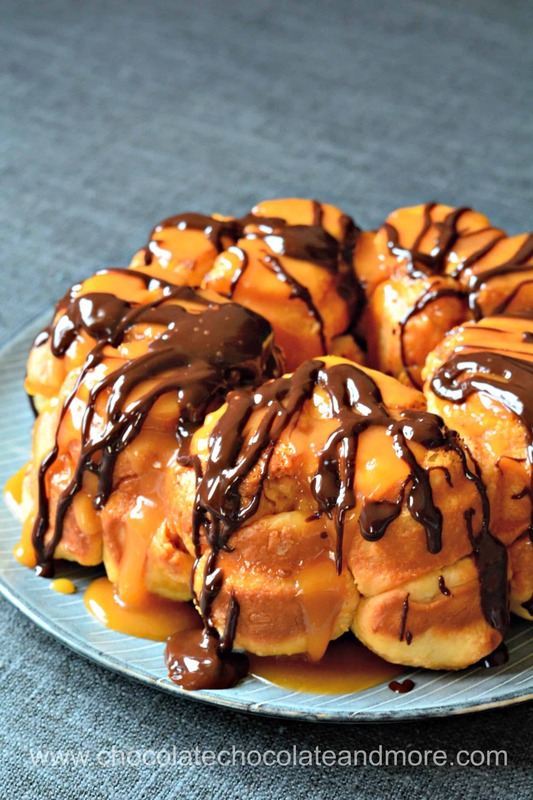 The melted chocolate and caramel inside each bite homemade toppings make chocolate caramel monkey bread addictive. This bread is best served warm while the chocolate filling is still melted. You can make this ahead and refrigerate overnight for a hot breakfast treat. Put the dough in the refrigerator before the second rise. Take it out and let it rise for about an hour (should rise for 30 minutes after it gets to room temperature). You can also cut corners by using store bought toppings instead of making caramel and hot fudge sauce. 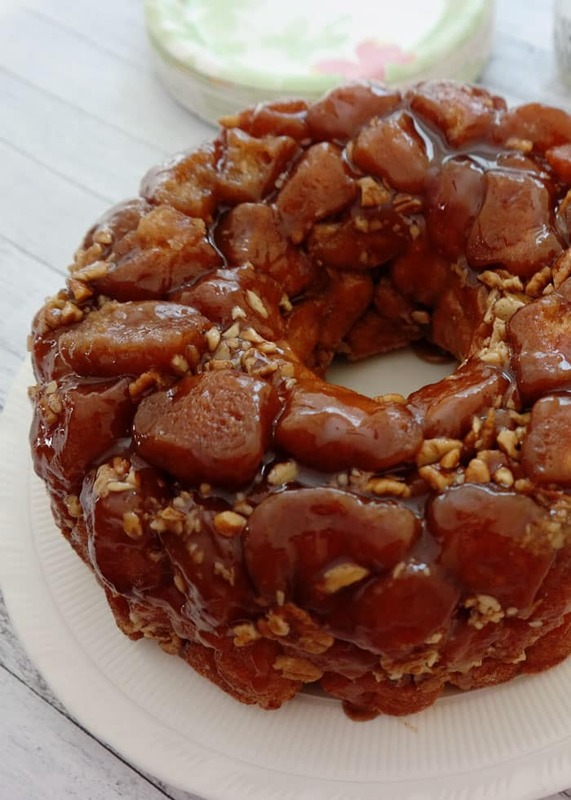 Chocolate Caramel Monkey Bread is decadent so you’ll want to share if you can bring yourself to do it. You could also top this with some whipped cream. Those of you in areas where you can’t find Hershey’s kisses can substitute squares of Cadbury’s Carmello bars or mini chocolate chips and caramel pieces. Mix first five ingredients together and let sit for about 10 minutes. The mixture should turn foamy. Blend in butter and egg. Add flour and mix together to make a soft dough - don't knead. Cover and let rise for 45 - 60 minutes until puffy. Roll out to an 8" x 10" rectangle. Cut the rectangle into four even pieces. Then cut each piece into 10 equal portions. Wrap a Hershey's Kiss in the center of each piece of dough. Pinch to seal the dough around the kiss. Place the balls in a buttered bundt pan. Mix melted butter and vanilla to make the sauce. Pour over the top of the bread. Cover and let rise for 30 minutes. Bake in a 350°F oven for 20 - 30 minutes until golden on top and crisp on the outside. Turn the hot bread onto a rimmed plate. Drizzle caramel and hot fudge sauce over the top. Thanks so much. I hope you keep coming back.